Uglyworld #972 - Worlds Recorder Solar Cell (Project BIG - 41-365), originally uploaded by www.bazpics.com. Pretends for a seconder that you didn'ts read the titles of this photograph, what does you thinks I is standings besides here. No it is nots chocolates (and no I didn't tries to eats it either), and is nots a tinys spy camera for a secrets agent. This is one of the bestest examplers of new technologies arounds, it was a worlds record holdings solar cell. What you means you doesn't knows whats a solar cell is, I can't believes that for a seconds! Solar cells takes the awesomes light rays from the suns and makes powers from them to allows you to runs lights and other electricalers items off of them. 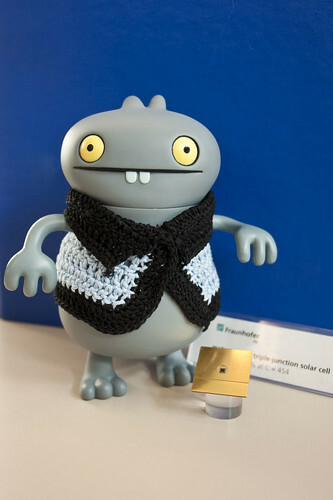 This particulars solar cell was mades by my friendlies in Freiburg at a researcher institute calleds ISE, where they is makings amazings researchers into all kinds of cools things! Even coolers is that they uses some of the bigs machiners that Baz workers on to makes it, doubles cool in my books! After spendings time with a world records holder I doesn't quite knows what I can do tomorrows now to follows it up, but befores I go I musts say a massivers thanks to all my friendlies in ISE for makings this photo possibles...!! !